Being a mermaid on land might inspire others to ask you some pretty interesting questions. Those inquirers might ask, how are you surviving without water and want me to get the bath started? That's all right, just kindly explain to them that you DO have lungs like an ordinary person, and while you like to drink water, you don't have to be fully immersed in it 24/7 in order to survive. You need to practice patience when you're a mermaid even though it's easy to get snippy when people badger you with intrusive questions. The best strategy is to be nice and informative when land-folks bombard you with their curiosity. Afterall, it's easy to be captivated by a gorgeous metallic mermaid tail. 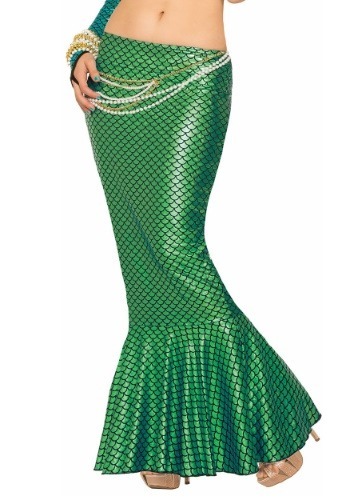 Wear this teal mermaid long tail skirt, and be prepared to be showered with compliments. The flattering floor-length skirt features a flared bottom and a comfortable elastic waistband. You'll feel like you're ready to party with your two-legged friends, but you should also be prepared to partake in some interesting and meaningful conversations about life on land versus life under the sea. You might have to repeat the following phrase to many inquisitive people throughout the night: no, we don't use forks for a comb, silly, but don't worry, you'll still have a fun, exciting, and meaningful Halloween.